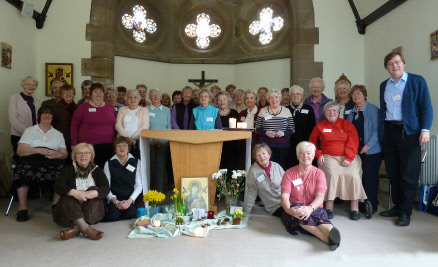 The 2013 Retreat was held from 9th to 11th April and was led by The Revd. Paddy Allen, Rector of the Strathearn Churches and co-ordinator of the Spirituality module of the Initial Ministry Education provided by the Theological Institute of the SEC. Her theme was Stature of Waiting -The Other Side of Ministry. This picture above shows the 2013 retreatants. There are more photos in the 2013 retreat photo gallery available by clicking here. If you would like to be added to the email list to be sent details of future Retreats when they are available, please click here.